I don’t post a lot of channelings, but this one sounds spot on. I’l be doing a video and an article on “How To Merge With Your Higher Self” in the very near future. Enjoy! 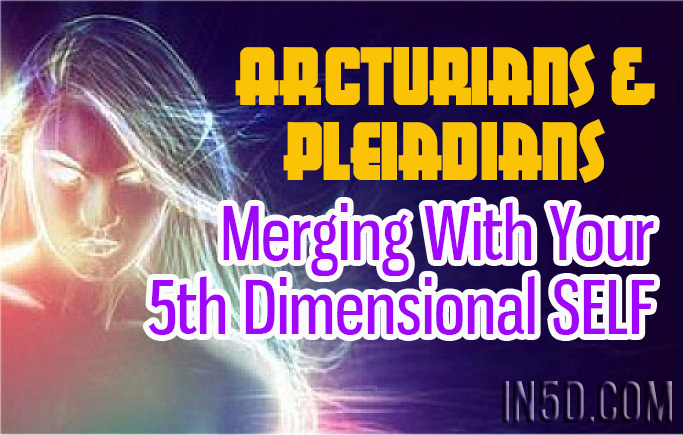 Greetings, we your Arcturian, Pleiadian, and higher expressions of your SELF, are in the process of joining with your fifth dimensional and beyond energy fields. This joining, which will occur only when you are ready, will flow into your third/fourth dimensional energy fields. When you/we blend that which is an octave jump beyond your present resonance, with your baseline resonance of third/fourth dimensional, you will move into an entirely different operating system. But in the fifth dimensional world there is here. But in the fifth dimension there is unity. But in the fifth dimension and beyond there is multidimensionality. Do you see the vast difference between the two octaves of reality? Do you realize that within your daily, physical life, you exist within BOTH realities? You are in a day-to-day, minute-by-minute, second-by-second process of integrating a frequency of Light into your third/fourth dimensional body, which is an octave jump beyond the frequency of Light that you have ever experienced in any of your incarnations on Gaia’s physical planet. Fortunately, your many incarnations in the Pleiades gave you the experience of resonating to a fifth dimensional body. Also, your experiences in the Violet Temple of Venus gave you the experience of actively shifting your resonance into the next, higher octave. Since the Pleiades and Venus are primarily fifth dimensional, the encasement of your consciousness has already resonated to the higher fourth and/or fifth dimensions. Furthermore, both the Pleiades and Venus have a baseline frequency of the higher fourth and threshold fifth dimension. From these perspectives you may say you are starting your journey at the midpoint on your traverse to “the peak of the mountain.” On the other hand, during your incarnations on the greatly wounded version of dear Gaia, on which you have taken your current incarnation, you begin your journey at the bottom of a very deep valley. “Yea, though you walk through the valley of the shadow of death, you fear no evil for thou art with me.” That “thou,” who is ONE with your Higher Self, lives within the resonance of the “All That Is.” Whether or not your third dimensional self is aware of it, you are in constant connection with your Higher Self. This connection is the best blessing that can be found as you journey through the valley of the shadow of the third dimension. Within this deep third dimensional valley is the shadow of ALL of the third/fourth dimensional incarnations that you have ever taken on planet Earth. Before you can reach the peak of the mountain, which is through the valley, you must confront, live, love, heal, and set free all of the shadows of your Self that you have spent during uncountable incarnations believing that you were just physical. But how could you go through all of these experiences in a time-bound reality such as Planet Earth? The answer is you cannot. You will need to move into your fifth dimensional states of consciousness and beyond in which you live within the NOW of the ONE. Within your fifth dimensional states of consciousness you know that you are not JUST the body that is having the difficult time adjusting to the fifth dimensional Light. YOU are the valley, YOU are the mountain, AND YOU are the peak. But YOU are also the valley of the shadow of death. But death is not an ending. Death is a transition from one frequency of reality into a higher frequency of reality. Ascension can feel very similar to your physical body dying. In order to ascend, or die, you must LET GO. Now when we say, “die,” we do not mean die as in your physical body no longer exists. When we say, “die,” we mean that you die to the old belief that you are ONLY your physical body and that if something happens to your physical body it happens to YOU. Now, while you are wearing your physical body it does appear that what happens to your physical body happens to you, especially while still operating under your third/fourth dimensional operating system. However, when you allow yourself to expand into your fifth dimensional operating system, you realize that YOU are the essence that is within your body. YOU are the “beingness” that makes your physical body be alive. Therefore, YOU have the ability to expand the consciousness of that physical body. You have the ability to raise the peak of the mountain while you are climbing the mountain. In other words, while you are walking through your daily life in which YOU are wearing your third/fourth dimensional body, you can simultaneously move through the ongoing process of transmuting your third dimensional physical body and your fourth dimensional astral body into your fifth dimensional Lightbody. The physical body that you are wearing cannot fully understand your process. Therefore, there is always doubt. Your process is to love that doubt, embrace that doubt, for doubt is the sum total of the third dimensional reasoning that you have learned so that you can confront a third dimensional reality that is NOT based on Truth. In fact, your third dimensional reality is based on illusion. In this manner, YOU are in the driver’s seat. It is wonderful that you read many things, that you study many things, for you expand your mind and activate your Multidimensional mind when you expose yourself to unique stimuli. It is also very wonderful when you allow yourself to slowly, carefully, and bit by bit, integrate this new information into your physical reality and into your own physical body. In this manner, you can calmly experience the transmutation that you must be willing to let go of everything that you have learned, studied, and/or worked hard to achieve in your physical reality. Now when we say “let go” that does not mean you need to leave your house, stop paying your bills, not go to work, etc. What we mean is that you must “let go” of the illusions that you have believed during your long duration of wearing an Earth vessel. Most important, “let go” of the illusion that you have lost your ability to remember to share your daily reality with your higher dimensional expression of Self. In other words, what you have lost is your natural innate connection with your fifth dimensional, and beyond, expressions of your Self. Whilst you are still wearing a human vessel, you will experience times in which you must be fully focused on your third dimensional life. There are also times when you will sleep or meditate so that you can experience your fourth dimensional vessel and your fourth dimensional life. And, there are especially times where you need to meditate in order to remember how your fifth dimensional consciousness feels. You may also experience this feeling in your fifth dimensional dreams. If you have these 5th dimensional dreams, please be sure to write them down the very second that you awaken for they will not remain in your third dimensional brain. We remind you to document your experiences because it is important that you hold onto the faith that you have in your SELF and the faith that you have in your process. Most important, please hold on to the faith that you have in your inner Self, in your fourth dimensional Self, in your higher Self, in your fifth dimensional Self and in all the higher versions of your self that are YOU. But which of these Selves of YOU, which of these many expressions of your SELF will you have the ability to have faith in? Our answer is you must have faith in all of them. You must have faith in all of YOU. You must have faith in all of your Selves. For faith represents your action of surrender. If you can surrender into every person, place, situation, and moment that you have ever experienced in any of your incarnations, then you will be able to have that faith to surrender in to the higher expressions of your SELF that have guided you through every one of these experiences in every one of your physical incarnations. If you can remember this process, you will be able to go back into all of these myriad realities and send them Unconditional Love and Violet Fire. You can also remind them that they/you were just wearing an Earth vessel within that NOW to learn more about living on a planet that is on the cusp of the transmutation into the next octave of reality. Furthermore, in all of your Earthly incarnations you needed to experience being human to more fully understand humanity. You needed to understand the workings of the third/fourth dimension, as you move into your chosen mission of transmuting that third/fourth dimensional reality into the fifth dimension. Unconditionally Forgive all that you experienced in all of those third/fourth dimensional realities and Unconditionally Accept that everything that you have ever experienced was a component of that which you chose to experience to best prepare for Ascension. It is then that you will be able to Unconditionally Love that YOU who is within this process of finding the Multidimensional You that has already ascended and who already inhabits many higher dimensional frequencies of reality. This conscious merging with your own Multidimensional SELF connects you with the line, the lineage, the multidimensional lineage, of the You within this NOW that YOU have always been. Blessings. We are happy to see so many of you fully awakening and preparing to assist Gaia with her Ascension.